Sometimes you just happen to be in the right place at the right time - and you get to witness for yourself something pretty remarkable. 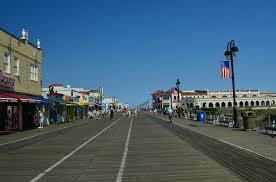 I was sitting on the Ocean City, NJ boardwalk a couple of weeks ago. It was around 9 p.m. And before you ask, yes, I was sitting there eating my favorite mint & chocolate cone from Kohr's. When in Ocean City, it's a must. A rather "different" gentleman who was perhaps 30-35 years of age, complete with a Santa Claus-type beard stopped not too far from us and put a poster and some markers down on the boardwalk. Then he took a very unprofessional-looking sign out of his bag and he stood there on the boardwalk holding up a sign that said, "Ask me to rap." Of course, I get mesmerized with things like this. I just had to stay put on that bench until I figured out what was going on. In just another minute or two, a group of 5 young people, perhaps 13-14 years old, came up and mentioned that today was one of their birthdays and asked if he could rap about that. He said, "no, I only do my own songs." They said, "okay then, rap for us." With that, the man began a very animated rap song about the way Christ had saved his life. I remember the closing line, "Don't let Satan win!" And then he flipped the sign over and it read, "Jesus Saves". Well, I guess I expected all five of the young people to either walk away, or at the very least to start rolling their eyes at one another. But that's not what happened. They stood there attentively. Then they put a few dollars in his basket, he handed them a CD of his music, and he asked them to kneel down and write something on the poster if they felt they wanted to give their life to Christ tonight. Which they all did - one by one. Not long after that, another group of young people stopped and what happened was almost identical - they listened and then they knelt down on the boardwalk and wrote on the poster. I just couldn't help myself. I walked up to the man and told him I was a Methodist minister and I was so excited by what I was seeing. I asked if he would rap for me and if I could video him. He said, "Sure!" When he was done, I thanked him for sharing his love for Christ with young people. Well, needless to say, I was blown away that night. I suppose it just goes to show you - Christ uses all kinds of different people to share the Gospel in all kinds of different ways.